Using our CCTV inline crawler camera, GPRS was able to access the 8 inch clay pipe to analyze the condition before and after the construction of the pool. The city required that the operator must be NASSCO certified and provide a NASSCO certified report to detail the findings. The report, along with pictures and video, is submitted to the city to allow though contractors project to be signed off for completion. GPRS arrived on site to perform the post inspections for the 8 inch VCP (Vitrified Clay Pipe) sewer main, after the pool was completed. The good news for the contractor was that the pipe integrity was good, and no damage occurred to the pipe during construction. However, the line was so filled with roots the survey was forced to be abandoned and resumed another day. 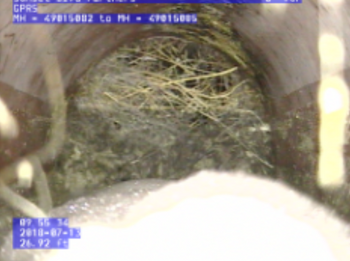 The contractor was able to contact a local hydro jetting company to come and clear the roots from the pipe, and GPRS was able to return the very next week with the city inspector to complete the survey. Please see the photos below showing the before and after. It is always recommended to have the lines jetting or cleaned before a video inspection survey is performed. GPRS does not perform jetting or cleaning, but we can always recommend a local person that we work with normally to assist on the project. With this growing demand for pre and post inspections, GPRS has made the effort to accommodate projects of all shapes and sizes. Even as small as 3 and 4 inch residential lines with a push style camera, and as big as 6” to 96” pipes using the inline crawler style cameras, GPRS can perform the survey. On many projects, GPRS will be asked to locate where the storm or sanitary sewer is at any given moment. For example: if the roots problem from our project above was too bad to be cleaned with standard jetting or cleaning, the contractor would need to dig down and replace that section of the pipe. 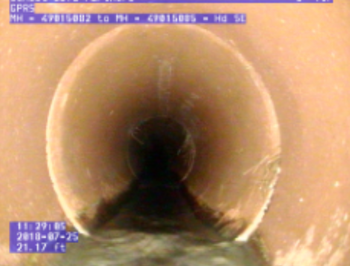 With the use of a sonde (radio frequency beacon), we are able to detect exactly where the camera is in the pipe. A sonde can either be internally built into the camera, or it can be battery operated and attached to the camera. In some cases, a battery operated sonde can allow for much deeper pipes to be located, even 30 or 40 feet deep! These sondes can operate at several different types of frequencies such as: 512Hz, 8KHz, 33KHz, and even 116KHz. Each sonde frequency allows the user different capabilities. A 512Hz sonde can penetrate through cast iron pipes but its depth can be limited since it is such a low frequency. With the use of sondes and CCTV inspection cameras, GPRS provides the ability of locating pipes that would otherwise, not be possible.